I finally took the dive and started on the costumes. Well, one of them. First things first: read the instructions. Read them again. And again. Check, check, check. 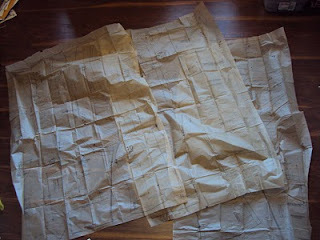 Next: lay out sheets upon sheets of pattern pieces on microscopically thin tissue paper and cut them out. Time: 45 min. 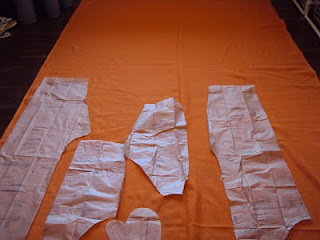 Third: lay out pieces exactly as mapped out in instructions so as to maximize your fabric. Except, mine was wider than the pic, even though I had 60" fabric and used that guideline. So I had a little leeway. 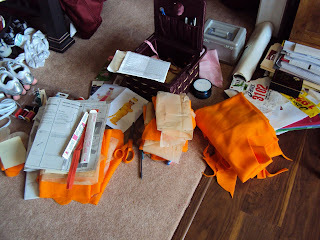 2.5 hours in, I have a billion oddly shaped pieces of fabric and tissue paper. Yes, 2.5 hours of cutting out stuff. I don't know how long it's supposed to take you, but that's my time. 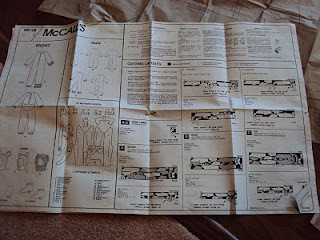 At least I can skip that step for the next costume since I'm using the same pattern. That's good for today. And? Happy 3 month Blog-iversary to me! I finally qualify to have my blog listed on the most awesome place to find other "mommy" blogs...I can't believe I only found it recently!! Yall can vote for me once a day. The more you vote, the higher my blog moves up in rank and the more people can see me!! Yay and Thanks!